Salmon, cauliflower, sriracha and a little parsley. and healthy recipe. The heat of the sriracha is tamed by baking, while it amplifies the flavors of the salmon and cauliflower. It’s delicious as is, or serve it with a dollop of Roasted Pepper and Sriracha Sauce. Can you tell that I love sriracha? Preheat oven to 350 F. Whisk olive oil and sriracha together in a small bowl. Arrange salmon in a baking pan. Brush with the sriracha oil. Slice cauliflower florets in 1/4 inch pieces and place in a bowl. Pour remaining oil over the cauliflower and toss to coat. Scatter the cauliflower around the salmon. 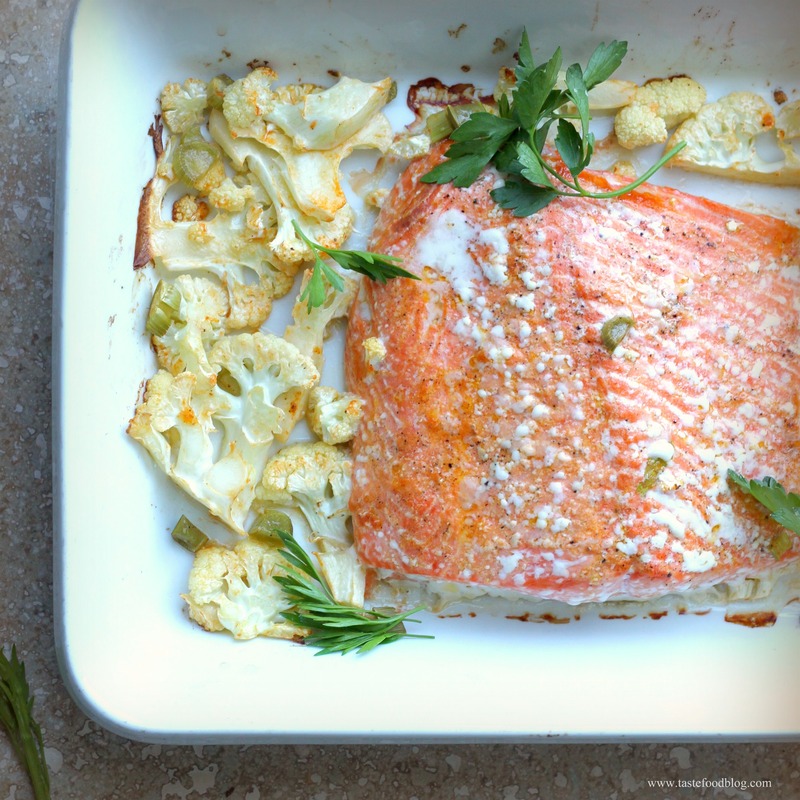 Sprinkle salmon and cauliflower with salt and pepper. Bake in oven until salmon is cooked through, about 30 minutes, depending on thickness of the fish. Garnish with parsley. Serve with Sriracha Roasted Pepper Sauce. To make the sauce, combine all of the ingredients in a bowl of a food processor. Puree to form a smooth sauce. My husband’s two favorites, salmon and cauliflower…I would never have thought to add sriracha – guess the olive oil must really temper the heat. This looks like a winner. Nice dish! Sriracha is wonderful and I like the way you have paired it with salmon and cauliflower. I will have to try this. Wow, you make cauliflower look good. Now if only my wife would eat it. I love this recipe. Haven’t had salmon in too long! Just found your blog through Foodbuzz–loving it. I love the simplicity of this dish and the fact that you added something a bit unexpected to elevate the flavors. It’s beautiful!